I’m very pleased that Nancy Ellis Taylor’s “Sarcophagus,” from inkscrawl 3, has placed 3rd in this year’s Dwarf Stars Award. Congratulations to Debbie Kolodji, whose “Basho after Cinderella” is this year’s winner. I’m also very honored that my poetry chapbook, The House of Forever, has placed second in the chapbook category of the first annual Elgin Awards. Congratulations to all who placed, and to Mary Turzillo for winning the book-length category and F.J. Bergmann for winning the chapbook-length category. 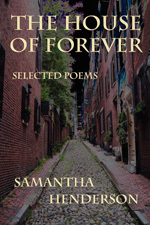 Very many thanks to Karen Romanko of Raven Electrick Ink for publishing The House of Forever.